In this piece from Mountaineer magazine, Youth Education Manager Andy Bassett reflects on his time outside as a child, and the importance of passing that experience on to the next generation. A little past noon, the younger members of our group started getting hungry. 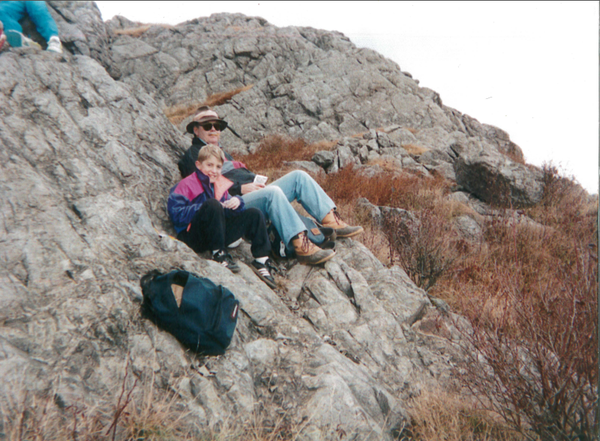 One of the parents found a small rock outcropping with a nice view for a bite, and I unburdened myself of my backpack and sat down next to my father. Taking in the early autumn air of the Appalachians, we ate the sandwiches he’d prepared earlier that morning. Hunger pains satiated, it slowly dawned on me that we were all enjoying something elusive in a group of half a dozen 10-year-old boys: quiet. As we took in the surrounding peaks and valleys, a friend of my father’s called to us and snapped a quick photo, a photo that currently resides on a bookcase in my house. It’s the memory I always come back to when I reflect on my life spent outdoors. I didn’t come from a particularly adventurous family. (I can still picture the puzzled look on my sister’s face when I asked for a #2 Camalot or new avy beacon for the holidays.) While my passion for climbing and backcountry skiing began later in life, the seeds of my love for the outdoors were sewn at a young age. From the beginning, my parents taught us the importance of protecting and valuing the wild areas around us. That Mother Nature could provide the most important lessons in life and that she often teaches, and never preaches. Andy and his father in the Appalachian Mountains. Courtesy of Andy Bassett. In a time before smartphones, my mother emboldened us to explore the woods around our house. Getting muddy was okay, getting a few scrapes was also allowed, and most importantly giving her some space was highly encouraged. The trees, blackberry bushes, honeysuckle vines, and the small creeks that formed after it rained became our playground. These joyful ways to spend a few hours of the day built the foundation for my adult life. I see a lot of myself in the kids I work with at The Mountaineers. Every day we provide opportunities for young people to explore and enjoy nature. Last year nearly 2,500 youth participated in adventures like climbing, snowshoeing, climbing, and kayaking. From an early age, our students are engrained with a desire to learn new things, a drive to explore their environment, and a commitment to conserve these places we hold so dear. Like I did as a child, they’re building values that will last a life time. This year we started a new program called Mini Mountaineers, which provides families and little ones an earlier entry point to our community. Twice a month, kids ages 2-5 and accompanying adults (parents, relatives, etc.) 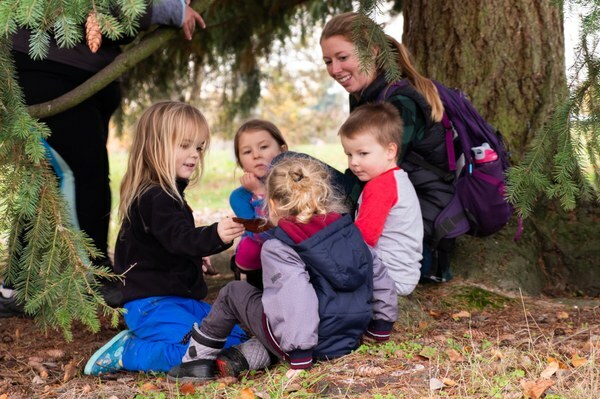 are invited to join us for activities like nature walking in Discovery Park and tracing leaves found in Magnuson Park. Our activities feed their youthful wonder and eagerness to understand the world around them. ASSOCIATE YOUTH MANAGER KATIE LOVE WITH MINI MOUNTAINEERS IN MAGNUSON PARK. PHOTO BY TREVOR DICKIE. This year we also continued to prioritize extending opportunities to youth who might not have resources to enjoy them otherwise. Of the 2,500 youth engaged this past year, nearly 30% came from underrepresented populations. Through partnerships with local youth serving organizations, our Mountain Workshops program led a total of 140 activities in 2018. These students felt what it was like to climb on real rock; they experienced the Type 2 fun of falling on Nordic skis. They pushed beyond their comfort zones to engage in outdoor experiential learning. For some, Rainier went from being a distant peak in the skyline to solid ground and snow beneath their feet. By exercising the human desire to explore, we hope young people’s eyes are opened to new possibilities – not just in nature – but in all walks of life. As an organization, we take enormous pride in protecting our public lands, a cause that’s particularly important for youth. Conservation not only ensures our ability to recreate in awe-inspiring places, but guarantees that future Mountaineers can share the same feeling we have today. In 2018, over 270 youth donated nearly 700 hours of stewardship work in areas where The Mountaineers lead programs. Students in The Mountaineers Adventure Club (MAC; ages 14-18) worked with partner organizations for three days to rebuild trails leading up to the Liberty Bell Group last August. Members of the Explorers Club (age 10-13) took a day in December to aid the Washington Trails Association in restoration efforts at Cougar Mountain. By creating a sense of ownership, we instill an ethic to protect the places where we play. 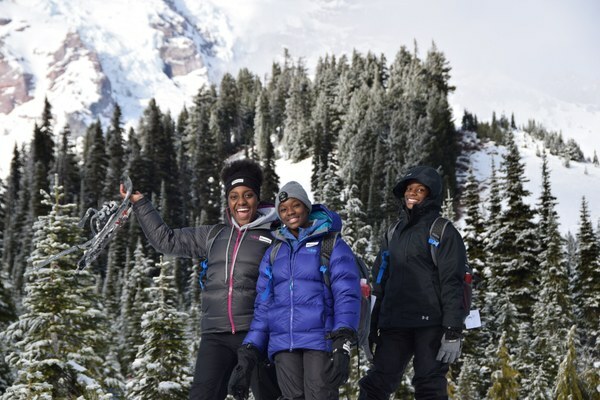 YOUNG WOMEN EMPOWERED TEAM UP WITH OUR MOUNTAIN WORKSHOPS PROGRAM AT MOUNT RAINIER. PHOTO BY HANNAH PIATOK. As many members of The Mountaineers know, our mission is to enrich the community by helping people explore, conserve, learn about, and enjoy the lands and waters of the Pacific Northwest and beyond. When I think back to my time as a child, l realize these are the same core values my parents instilled. Like my sisters and I, who have each found different ways to embody these lessons and make a life of outdoors a part of who we are, the students I have the pleasure to serve each year also have the freedom to discover what the outdoors means to them. I hope our Mountaineers youth learn lessons that benefit their lives, broaden their horizons, and inspire them to conserve the things most important to them. By doing this, we are not just establishing the next generation of Mountaineers, but also supporting the growth of thoughtful, humble, and passionate people.